by WARWICK R. BURTON, M.A.Cantab. Reproduced with permission from the second edition 1981, published by: M.T. & W.R. BURTON, Marple. 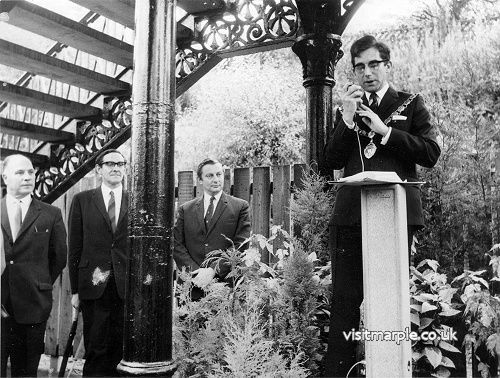 This version of the book was first published on the Marple Website in 2002, with the kind permission of author Warwick Burton and his father Monty, who wrote an addendum for the web site. 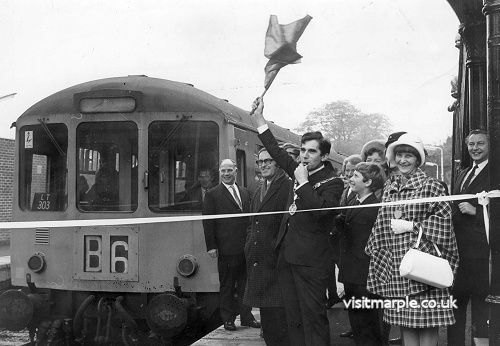 Monty Burton waves the flag at the official reopening of Marple Station on 28 October 1970. Warwick Burton at the launch of his new version of this book on 2 July 2015. 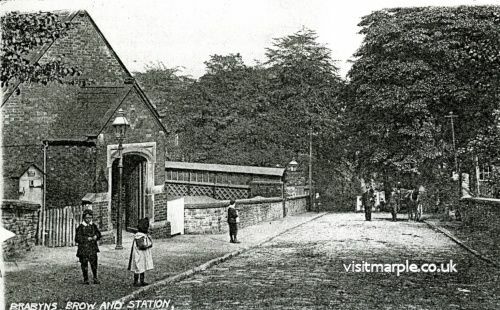 Since I first started this web site I had been conscious that information regarding the history of Marple's railways was a major omission. A number of visitors commented on this and I'd always replied that 'it's on my list of jobs to do' and I'll get round to it eventually. To be honest though, I was rather daunted by the scale of this subject and the amount of research and in-depth knowledge necessary to do it real justice. Initial investigations identified that when I did eventually find the courage to tackle this task, a major source of information would be a book called 'Railways of Marple and District From 1794'. In fact, this would probably be the only book I would need because it is the definitive history of Marple's railways. If you go and stand on the Brabyns Brow Bridge and look at Marple Station today, you will see a small, quiet suburban station served by diesel units shuttling every half-hour between Manchester and New Mills. If you are lucky you may see a goods or express passenger train pass through. But if you had gone to the same spot in the 1890's, you would have looked down upon a busy main line station at the height of its importance. A large, four platform layout with a substantial range of buildings and a fine array of canopies built to deal with throngs of passengers would confront your eyes. To one side, instead of a car park as now, you would see a small but busy goods yard handling every kind of merchandise. Instead of diesels of uniform appearance, you would be struck by the variety of liveries borne by the locomotives and carriages. The number of people whose writings, photographs, reminiscences and assistance have helped towards the production of this book is too numerous to recount, but to them all I am very grateful. But I first must acknowledged my debt to my father, who first stimulated my interest in railways, and over the years has given guidance and assistance in my researches. I owe a great deal of the detailed information and reminiscence, which puts the flesh on the bare bones of my book, to the late Mr. "Hughie" Fletcher. He was intimately acquainted with the railways of Marple from the last years of the 19th century until his death a few years ago, both as a child, then as a joiner in the employment successively of the Midland Railway, L.M.S. and B.R., and subsequently as a Maintenance Foreman, and finally in retirement. The origins of the earliest railways of the district are inextricably bound up with the preceding canal era, and the need to improve transport facilities between Sheffield and Manchester, which as manufacturing centres grew enormously in the early 19th Century. The Peak Forest Canal was incorporated in 1794 to run from Ashton via Marple to Bugsworth and Whaley Bridge, with Samuel Oldknow a leading promoter of the scheme. 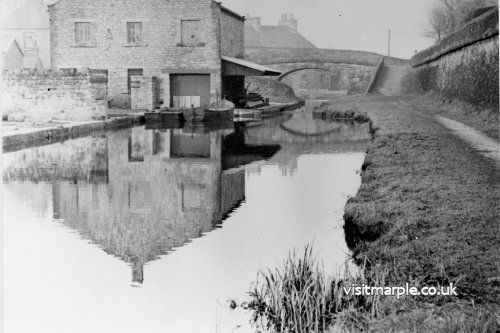 The main part of the canal was opened in 1796, the exception being the Marple flight of locks, and the Aqueduct over the Goyt, which were not completed until 1800 and 1804 respectively. In the interim, an inclined plane tramway, with horse traction, ran from the base of the Lime Kilns at Top Lock to join the end of the canal from Ashton. 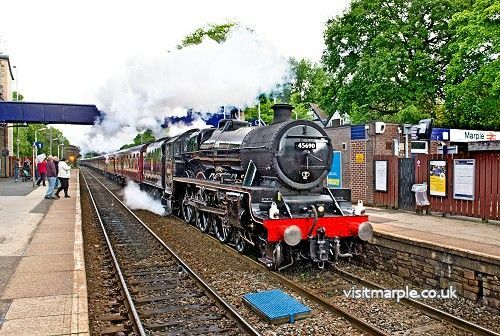 The next fifteen years are a tale of the railway which was coming to Marple, but never actually got there for one reason or another. The year 1845 marked the height of the "Railway Mania", when a multiplicity of competing and needless schemes were proposed; most of them collapsed when the bubble burst in 1846. Two mania schemes were eventually built however, and had a great effect on our district. The first was the ponderously titled "Manchester, Buxton, Matlock and Midlands Junction Railway" (M.B.M. & M.J.), which was to make a line from Cheadle Hulme to Ambergate, and thus provide a route for the M. & B. to Ambergate and so to London independent of the Grand Junction Railway (G.J.R.) with which the M. & B. was in continual dispute. 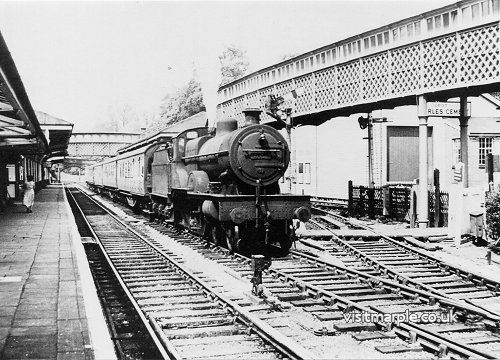 We must now return to 1845 and the Railway Mania to trace the steps by which the Midland came to play such an important part in the railways of Marple. Remember the Manchester, Buxton, Matlock and Midlands Junction Railway? (M.B.M. & M.J.). The line was projected in the 'Railway Mania 1845' as a means of providing the M. & B. with an outlet to the south independent of the Grand Junction Railway route via Crewe. Unfortunately as soon as the M.B.M. & M.J. got its Act in 1846, its most enthusiastic supporter, the M. & B., amalgamated with the Grand Junction and other railways to form the L.N.W. and the L.N.W. was not interested in a route to London competing with its own.